ABC For Dance and The Body Series present FUNctional Anatomy for Dancers. Written for dance teachers, by dance teachers with the goal of providing fun and educational exercises to explore anatomy. Teachers and students will come away from these guides with a greater understanding of efficient alignment and biomechanics. Meet Your Body was mentioned in the August 2007 issue of Dance Studio Life Magazine in the article Navigating the Landscape of Injury by Nancy Wozny. It was also featured in the December 2006 Issue of Dance Teacher Magazine. Meet Your Body! 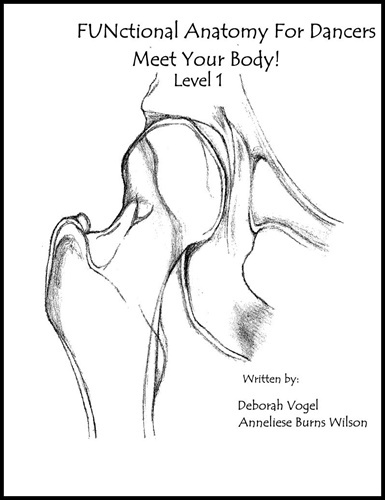 is the first level in the FUNctional Anatomy for Dancers Series. This level introduces joint motion and proper movement vocabulary from the feet to the head. Bite sized anatomy lessons designed to be taught in any dance class. Student activity sheets reinforce the classroom exercise with training their eye and movement reminders. Dancers reduce their risk of injury by educating themselves on proper biomechanics and anatomy. Great for dance studios and academic dance programs. The Anatomy books have helped my learners tremendously and their theory marks for exams have certainly improved. They love doing the excercises together with the theory and also filling in the worksheets. Anatomy forms a large part of our school curriculum for Dance Studies. I'm always looking for new and extra information for my students!